Note: This article is based on the book Project Workflow Management: A Business Process Approach by Dan Epstein and Rich Maltzman, published by J Ross Publishing in 2014. The book describes PM Workflow® framework, the step-by-step workflow guiding approach using project management methods, practical techniques, examples, tools, templates, checklists and tips, teaching readers the detailed and necessary knowledge required to manage project “hands-on” from scratch, instructing what to do, when to do and how to do it up to delivering the completed and tested product or service to your client. Reduce demands for highly qualified project managers using the step-by-step workflow guiding approach. Project Manager (PM) – responsible for ensuring all steps of the project management process are followed. The PM ensures that the project team is involved in all stages of the project implementation and tracking. The PM tracks the construction, the detailed design and reviews the status of the Frame on a weekly basis with the Client and on monthly basis with the Senior Business and Senior Delivery Management. In some environments, the PM reports status of the project to the Senior Business Manager on a weekly, rather than monthly basis. Delivery Team (DT), also referred to as Delivery Team Members. The assigned Delivery Team Members will be responsible for producing detailed design and design implementation. They will also participate in Quality audits and reviews. Each member of the Delivery Team will present individual weekly status reports to PM during the scheduled project status meeting. Client – This is a lead client and a single focal point to the business. The Client should participate in all status review meetings scheduled by the PM. The Client sometimes is referred to as the Business Project Manager or the Business Area Lead. The Client usually reports to the Senior Business Manager. Technical Lead – this is a leading technical specialist, a member of the Delivery Team. The Technical Lead is responsible for producing the detailed design and the design implementation. The Technical Lead will assist the PM in updating the WBS and gathering estimates from members of the Delivery Team. Senior Business Manager – This person will review Monthly Status Reports with the PM. The Senior Business Manager usually reports to the Project Sponsor. Senior Delivery Manager – This person owns a delivery budget, whose signature is required on the Statement of Work. The Project Sponsor is a major stakeholder. A Project Sponsor is responsible for the business success of the project, specifically, ensuring that the business objectives are met for which the project has been undertaken. The Project Sponsor is the owner of the overall project. 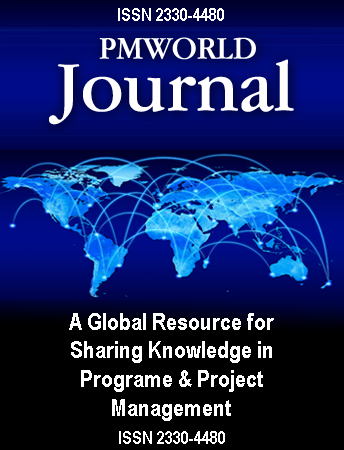 Editor’s note: This series of articles is based on the book Project Workflow Management: A Business Process Approach by Dan Epstein and Rich Maltzman, published by J Ross Publishing in 2014. The book describes the PM Workflow® framework, a step-by-step approach using project management methods, practical techniques, examples, tools, templates, checklists and tips. The book teaches readers how to manage a project “hands-on” from scratch, including what to do, when and how to do it up to delivering a completed and tested product or service to a client. Dan Epstein combines over 25 years of experience in the project management field and the best practices area, working for several major Canadian and U.S. corporations, as well as 4 years teaching university students project management and several software engineering subjects. He received a master’s degree in electrical engineering from the LITMO University in Leningrad (today St. Petersburg, Russia), was certified as a Professional Engineer in 1983 by the Canadian Association of Professional Engineers – Ontario, and earned a master’s certificate in project management from George Washington University in 2000 and the Project Management Professional (PMP®) certification from the Project Management Institute (PMI®) in 2001. Throughout his career, Dan managed multiple complex interdependent projects and programs, traveling extensively worldwide. He possesses multi-industry business analysis, process reengineering, best practices, professional training development and technical background in a wide array of technologies. In 2004 Dan was a keynote speaker and educator at the PMI-sponsored International Project Management Symposium in Central Asia. He published several articles and gave published interviews on several occasions. In the summer of 2008 he published “Methodology for Project Managers Education” in a university journal. His book, Project Workflow Management – The Business Process Approach, written in cooperation with Rich Maltzman, was published in 2014 by J. Ross Publishing. Dan first started development of the Project Management Workflow in 2003, and it was used in a project management training course. Later this early version of the methodology was used for teaching project management classes at universities in the 2003–2005 school years. Later on, working in the best practices area, the author entertained the idea of presenting project management as a single multithreaded business workflow. In 2007–2008 the idea was further refined when teaching the project management class at a university. Dan is an author of many publications in professional magazines, speaker at the international presentations, a guest at podcasts, etc. The Project Management Institute’s (PMI) assessment of his book says: “Contains a holistic learning environment so that after finishing the book and assignments, new project managers or students will possess enough knowledge to confidently manage small to medium projects”. The full list of his publications and appearances can be found at the website www.pm-workflow.com in the Publications tab. Dan can be contacted at dan@pm-workflow.com.